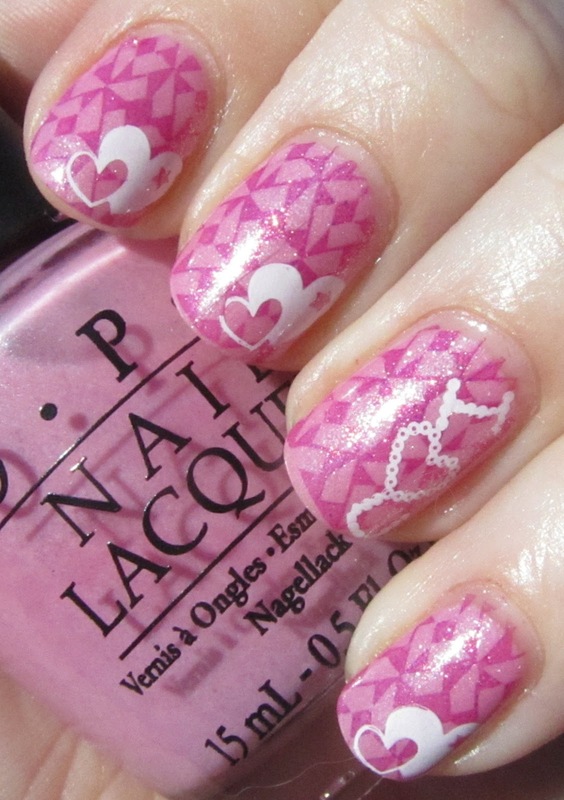 Here is another pretty in pink Valentine's mani I did, which I wore this weekend. A bit softer colors than the previous plaid mani - soft and shiny and cute. For these nails, I started off with OPI Pedal Faster Suzi! from the Spring 2012 Holland collection. This gorgeous shimmery pink was the perfect base for this mani - look for swatches from the collection sometime in the next week or two. For the base stamping image, I used Zoya Reva and Red Angel plate RA-108. The accent finger design (I ❤ U) was done using BM-02 and the hearts are from Konad plate m59, both done with Konad Special White. I really enjoyed this mani. The shimmer in both Pedal Faster Suzi and Reva worked really well together and I love that accent nail design! Lots of compliments on this one too. I have one more thing up my sleeve for the actual day tomorrow, but I won't be able to get pictures of it until later, so I will show you all that the day after Valentine's Day. So until then, have a great day tomorrow! Exttremely cute. your application is perfect. Very cute! I love those two pinks together! oiinn it's sooo lovely, I am really jealous! I love this!! So adorable! Oooh I really really like this!!! Can't wait to get my Pedal Faster Suzi, it's en route... With your permission I would love to replicate this look sometime!